Stable isotope analysis of ancient Eskimo hair found in Western Alaska could reveal how people in the region lived through times of climate change and provide a better understanding of human responses to past climate change in the Arctic. A team of experts from the institution – including doctors Rick Knecht, Charlotta Hillerdal and Kate Britton – returned this week from a three week dig near the modern Yup’ik Eskimo village of Quinhagak – the first large scale archaeological investigation into the prehistory of this region, which is three times the size of Scotland. They will discuss their research and the artifacts they uncovered at the British Science Festival on Friday September 7. Dr Rick Knecht from the University of Aberdeen’s Department said: “Our work focused on a site called ‘Nunalleq’ – meaning ‘the old village’ in Yup’ik, which dates from 1350AD-1650AD. “Featuring permafrost-preserved house-floors, the site is an early Eskimo winter village, and has yielded tens of thousands of in situ archaeological artifacts and tools. “Some, like the preserved beach rye grass baskets and cordage are extremely rare in any archaeological context. “The preserved human hair, fur, plant and other bioarchaeological materials are also among the largest and best preserved collections of their kind ever recovered. “Radiocarbon dating at the site suggests at least two phases of occupation, both before and after the onset of the ‘Little Ice Age’ – a pre-modern global temperature excursion event. “Data from this project is therefore key to understanding human responses to past climate change in the Arctic; understanding human resilience; and the long-term relationship between Arctic peoples and the Bering Sea environment. 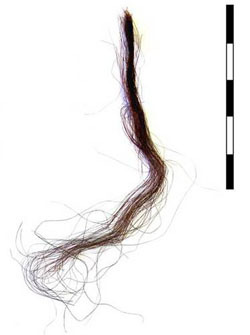 Stable isotope analysis of the preserved human hair uncovered at the site are now being undertaken in a bid to understand the diet of these early Eskimo people and what this reveals about the conditions under which they were living, and how they adapted to a changing climate. Dr Kate Britton from the University of Aberdeen’s Department of Archaeology said: “Stable isotope (chemical) ‘signatures’ in human hair are directly related to the ‘signatures’ of foods consumed – literally, you are what you eat. “In archaeological studies, this is used to provide evidence for which animal species were being hunted and eaten. Furthermore, human hair grows at an average rate of 1cm per month – so by chemically analyzing it 1cm at a time we can obtain a month by month dietary ‘signal’ which indicates what these people were eating over a period of time. “The hair we have recovered from Nunalleq isn’t from burials but was cut off during haircuts and has either accidentally ended up on the floor like barbershop waste, or was ritually deposited on house floors. “We hope our analysis will allow us to evaluate dietary changes in Western Alaska at this time, determine the contribution of marine and terrestrial animals to the human diet and explore the implications for early subsistence strategies and maritime adaptations. “If we can better understand how these people sustained themselves during what we know was a significant time of climatic change – we could learn important lessons about how these coastal communities have coped with climate change in the past. Arctic sea ice is at a record low, and the issue of climate change is more important than ever, particularly for indigenous communities in the Arctic whose traditional lifeways are under threat. The changing climate not only affects the weather, but also the distribution and abundance of important subsistence species such as salmon, caribou and seals. Qanirtuuq, Inc., the village land owning corporation of the Yup’ik Eskimo village of Quinhagak, brought in Rick Knecht and his team at the University of Aberdeen, in an effort to save the priceless artifacts from the sea and gain as much information as possible about how their ancestors lived and coped with their own climate change challenges. Be the first to comment on "Analysis of Ancient Hair Could Reveal How People Adjusted to Past Climate Change"